It’s been seven years since hurricane Katrina devastated Louisiana, turning New Orleans into a muddy disaster area. 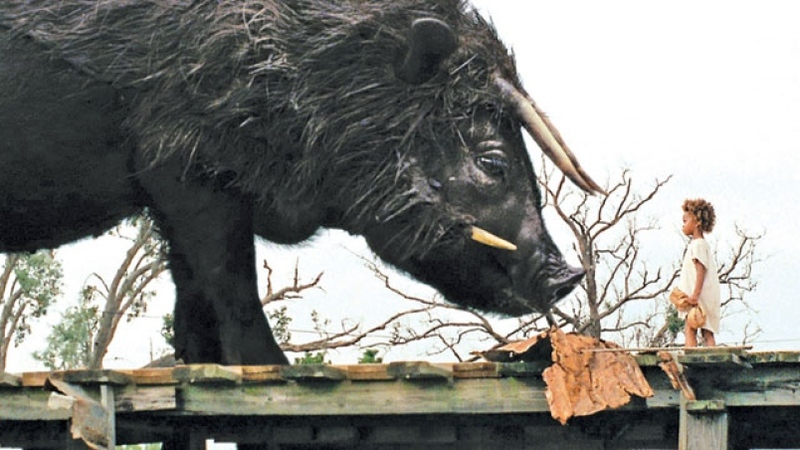 Right now, as hurricane Isaac passes directly over the southern American states, punishing the coastline with surging tidal waters and pounding winds, it adds a surreal element of prescience to director Benh Zeitlin’s ‘Beasts of the Southern Wild’. Set much farther into the future, ‘Beasts of the Southern Wild’ isn’t about natural disasters as much as the people left behind. The worst has already happened and society is living through the lasting effects of a severe polar ice cap melt. The world is flooded, new high water marks have pushed most residents farther inland. It’s in one of the rural outlying communities, the wild and unrestricted ‘Bathtub’ region of the flooded deep south of America, that we meet the fiery 6 year-old Hushpuppy. What unfolds is something of a partially narrated parable; an adventure movie following Hushpuppy and her father, their friends and precariously tethered community as it fights to remain free from outside interference. I have a soft spot for destroyed beauty on screen. Something about the junkyard kaleidoscope of textures makes me look twice at how we fit into the world—or how we bend the world around us to our basic human needs like shelter, food and companionship. I’d call that the core message behind ‘Beasts of the Southern Wild’. 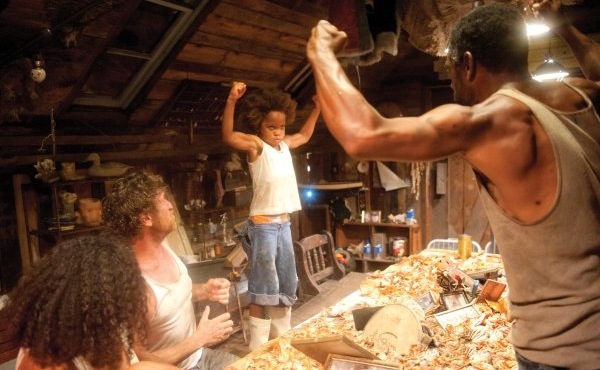 Watching the dynamic between Hushpuppy and Wink sells the drama and tension in ‘Beasts of the Southern Wild’. That message is ultimately sold through some impressive performances—particularly from Quvenzhané Wallis as Hushpuppy. Her performance is so natural and powerful that you’ll genuinely care about her struggle. Her father, Wink, played by Dwight Henry is equally amazing. He approaches the role with bursts of ferocity over a well-hidden core of paternal tenderness. The dynamic between father and daughter are perfectly captured here. The support cast, largely comprising non-professional actors, adds immensely to the authentic feel. Again, it’s the naturalism of the performances that breathes so much authenticity into their situation. It gets to the point where, while I’m sitting here watching hurricane news reports roll in, I start to think, well, maybe this is where we’re heading. Full credit for provoking that kind of response—or maybe I’m just a sucker for the doom and gloom. Who knows, eh? Films like ‘The Road’, and even the ramshackle floating pontoon cities in ‘Waterworld’ share a similar mindset with ‘Beasts’. Zeitlin has crafted a world of pieced together technologies, where the floating tray of a truck becomes a fisherman’s skip, houses become makeshift community centres and everything is coated thickly in dirt and debris. There’s a poignant horror here, watching children grow up knowing only detritus and watching them thrill to a bellyful of prawns while constantly on guard from the pressing threat of rising waters. Like ‘The Road’, by following a child through this dangerous vision of the future, it offsets Hushpuppy’s naiveté against just how dark and dire her circumstances are. This ups the tension for the audience because we, more knowing and worldly than her, can see a wider view of the dangers she faces. Be it because of the effects – or the weaving into the narrative itself – but the Aurochs don’t always fit well into the story. Is that such a bad thing though? If there are faults within ‘Beasts’, it lies with the core story. At times, the conflict at the heart of the narrative is fairly predictable, building early towards an inevitable conclusion. In a possible-world as shocking as this, what eventuates contains few twists. As an adaptation of a stage production, it’s possible the screenplay was a little hamstrung though. The Aurochs – ancient beasts unleashed by the melting ice caps – are the other side of the titular beasts of the south. Rather than heavy effects work, Zeitlin opts for forced perspective, deliberately making these towering, horned, boar-like creatures into something out-of-synch with reality. Some will definitely balk at this visual approach; their inclusion as this outside threat isn’t as neatly woven and convincing as the rest of the world. I like the style, but I feel I’m going to be in the minority here. However, the quality of the cinematography, the engrossing world and conviction of the amateur cast propel ‘Beasts of the Southern Wild’ out of the murk. It treads a fine line between ecological siren and tense drama, with just enough black humour to wash it down easily. This is a film that manages that rare bridge between end-of-days epic and intimate humanist storytelling – fantastical but still just rooted enough to be depressingly plausible.